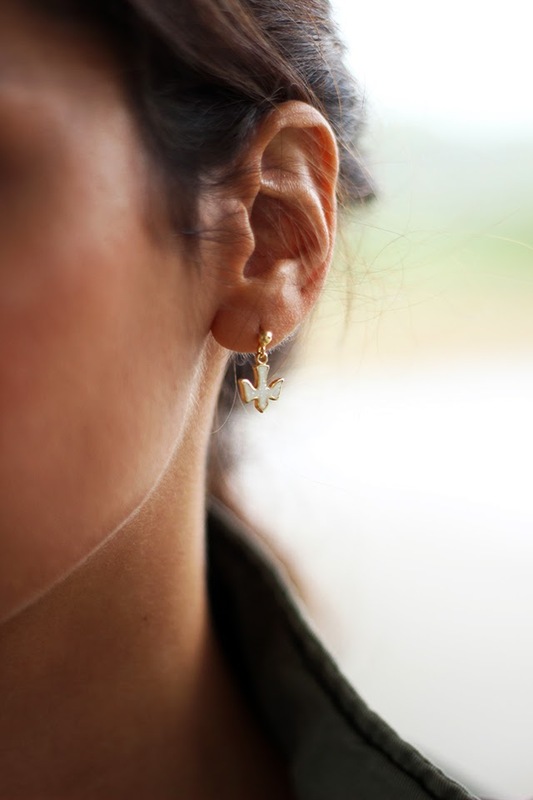 Os brincos com a pomba da paz foram amor à primeira vista. Devem ser das minhas peças preferidas (e adoro todas, ou não tivessem sido escolhidas por mim xD). A escrava e o anel do nó parecem ter sido feitos para serem usados juntos. E quanto à aliança...adoro os pormenores (o facto de ser dourado baço, o facto de dizer "amour" e de ter um coraçãozinho! Linda!). These earrings with the Peace Dove were love at first sight. They're definitely between my favourites (and I mean, I chose every single piece, so I love them all xD). The bangle bracelet and the knot ring must've been made to be worn together. And as for the wedding/commitment ring...Love its details (the tarnished gold, the fact that it sais "amour", the little heart...! Beautiful!). - Rua D. António Ferreira Gomes, nº314, V.N.Gaia (Portugal) (endereço da loja/ store's address). I'm loving Hellen's sophistication! And let me say that you are the best testimonial... Always stylish and perfect! que gira! adorei este look prático e ideal para todos os dias! the accessorize are amazing!! and i like also the outfit! cool! well done sweety! come to find me on my blog..will be a big pleasure for me if u want to follow each other..kisses. A parka é tão linda, nunca a vi na primark...que pena! Adorei os anéis, são muito elegantes! Really love this look. The parka is the best clothing that I have seen today. Makes me wish even more that we had a Primark over here too. The jewelry looks stunning as always. Love every single piece. Adorable sweetie! 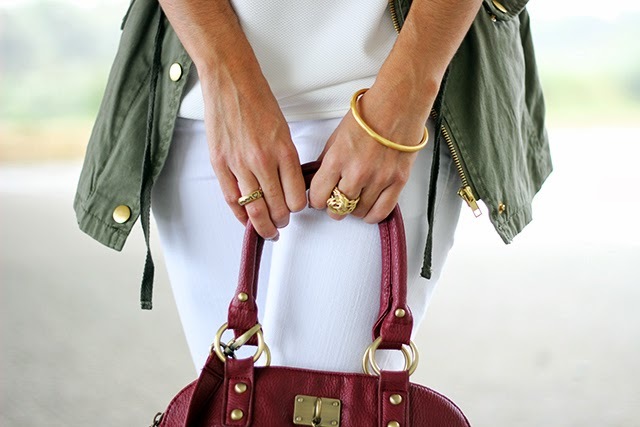 Total white and parka? It's a wonderful mix! What a lovely jacket! And totally love the first capture :)! Hey girl, I always forget to ask you, do you have a Facebook page for your blog :)? You should totally do it :)! And I'll be your nb.1 fan :D! Great look, love that jacket! Oh wow! I LOVE your jacket! 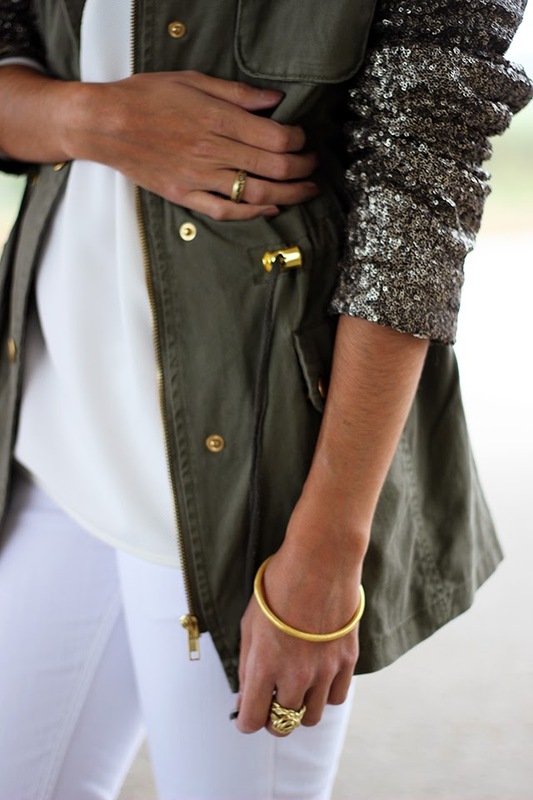 Usually when jackets like that have contrasting sleeves, it leather but I really like that yours is sequined! Very unexpected and chic! Gorgeous outfit! The shoes are adorable! Estas linda para não variar! O look 'quase branco total' ficou muito giro! Os acessórios da Hellen's já deu para perceber que são muito giros! beautiful accessoires sweety! and i love your parka! I'm absolutely in love with th parka! It's so unique! I have seen leather sleeves but never glittered sleeves in design!!! O conjunto é muito giro e a joalharia também! Oh adorei! Esse casaco é lindo e fica-te perfeito! So amazing really love this outfit! xo! You lokk gorgeous! This parka is great! Your parka is really amazing!! Vi essa parka da Primark e já não tinha o meu tamanho :( É super gira! Adorei os anéis e a pulseira. I LOVE LOVE LOVE that coat! wow, these accessories are really perfect...so simple, elegant and perfect...wonderful earnings, bracelet and rings...and I really like the outfit too, cool parka looks good with white. 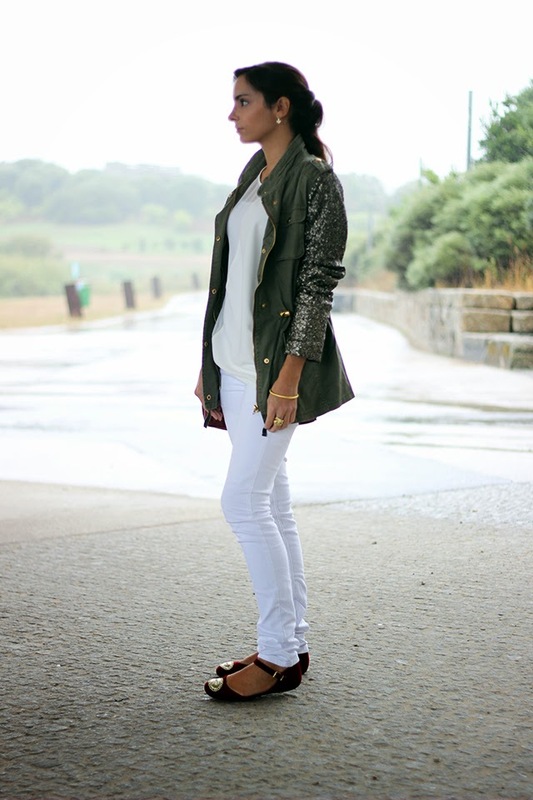 The flat shoes are my favourite piece on this look, beautiful coat too! Me gsuta mucho la chaqueta, es preciosa!!! love your outfit,it'so so elegant and chic!!! oh,and the color of your shoes is super!!! Love this look, it's neat and essential but with lots of style! I dont have words, u looking gorgeous. Cute shoes and all ur accessories r amazing dear! Great photos, amagazing look. I love the jacket. Love your outfit!!! Especially the shoes are awesome!! Love everything in this outfit, great as usual! And your parka is not as sporty as most others I ve seen so far. Simplesmente ADORO essa parka, fica bem em qualquer look! 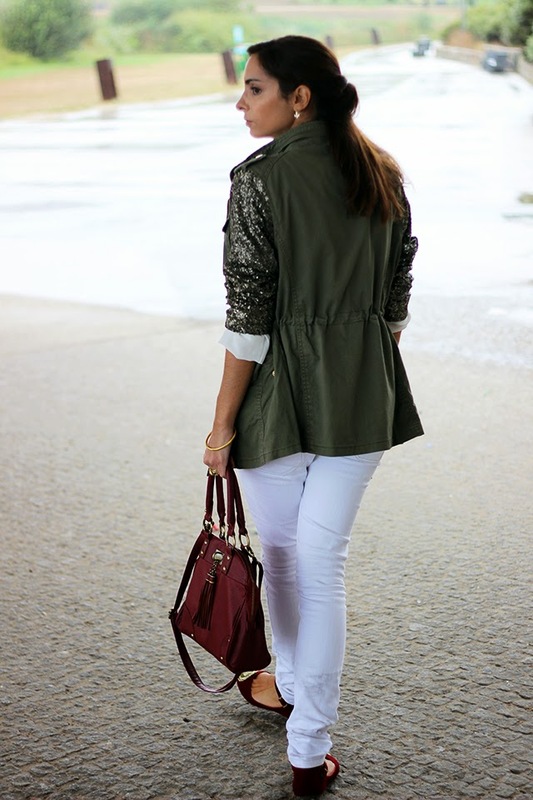 Love the military green parka but I have not seen it yet with sleeves like that. Love it! A parka é super original. Adorei!